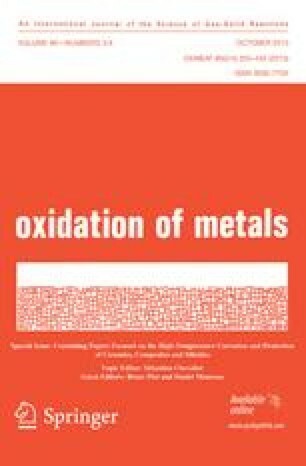 The kinetics and the mechanism of sulfurization of Fe-Cr alloys containing from 0.35 to 74 at. % Cr were studied in the temperature range 700–1000°C. The sulfurization was conducted in sulfur vapor at atmospheric pressure. The reaction rate was determined by the continuous gravimetric method. The scale composition was studied by X-ray and electron microprobe methods. The contribution of the reactants to the process of material transport through the scale was examined with both the marker method and the autoradiographic method using the radioactive isotope35S. It has been found that, irrespective of alloy composition and temperature, the sulfurization follows a parabolic rate law. On the dilute alloys (up to about 2 at. % Cr) the scales formed are monophase consisting of Fe1−xS only. In the range 2–40 at. % Cr the scale is a heterophase mixture of Fe1−xS and the mixed spinel FeFe2−xCrxS4. On the chromium-rich alloys the scale is monophase and is built of a solid solution of FeS in Cr2S3. The scale growth on the alloys under examination proceeds without the participation of the inward diffusion of sulfur. The mechanism of the scale formation has been proposed.